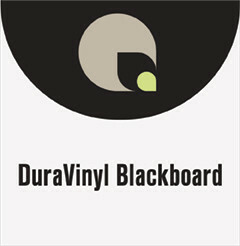 DuraVinyl BlackBoard is a 5 mil vinyl film that is the perfect solution for applications that require a chalkboard finish with either a removable or permanent adhesive. Available with either permanent or removable adhesive. Removable adhesive is reposistionable and will remove from surface without causing damage. An outstanding choice for a variety of applications including menu boards, retail displays, meeting rooms and school settings. Specially formulated for digital printing with UV curable inks.